WIPWednesday 12-21-16 — Knit'n Kitten Fiber Arts, Inc.
Table runner for the knitting table of the shop. 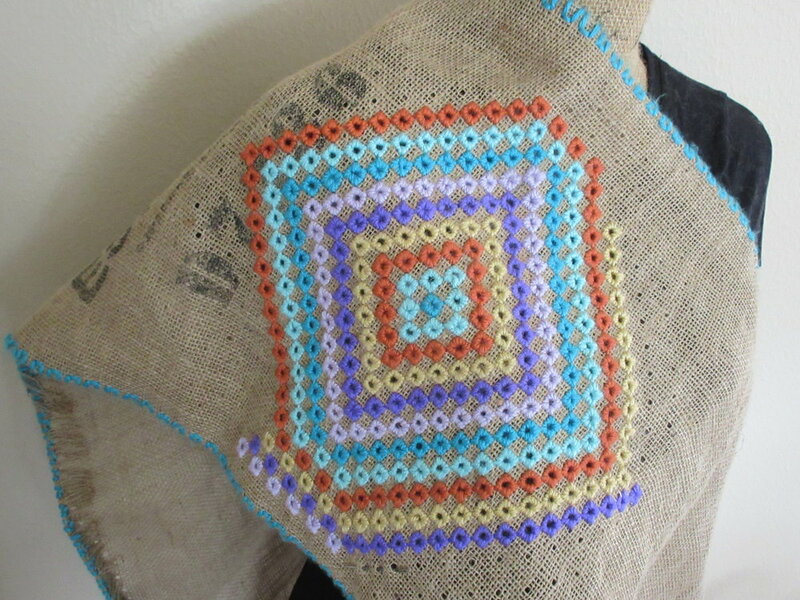 Needlepoint is fast to work any way and using worsted-weight yarn on burlap means the stitching practically flys along. I had finished the neckband row and was into the second round but got a little too enthusiastic taking out a scallop and had to start over. Being me I took the opportunity to change it a little and went with three knit rows and a purl row instead of garter stitch. I think the more isolated purl rows bring out the color changes better than in the previous try. Continuing to work on the new brioche bag. I think I will have the grey on the outside so it will go better with my black and grey outfits. I decided to use normal sewing thread for the lining which means the seaming is going much faster. This is the first time I've used a non-knit fabric and I hope the lack of stretchyness won't be a problem. As soon as I get the pockets sewn on the lining will be finished and I can focus more on the outer shell.